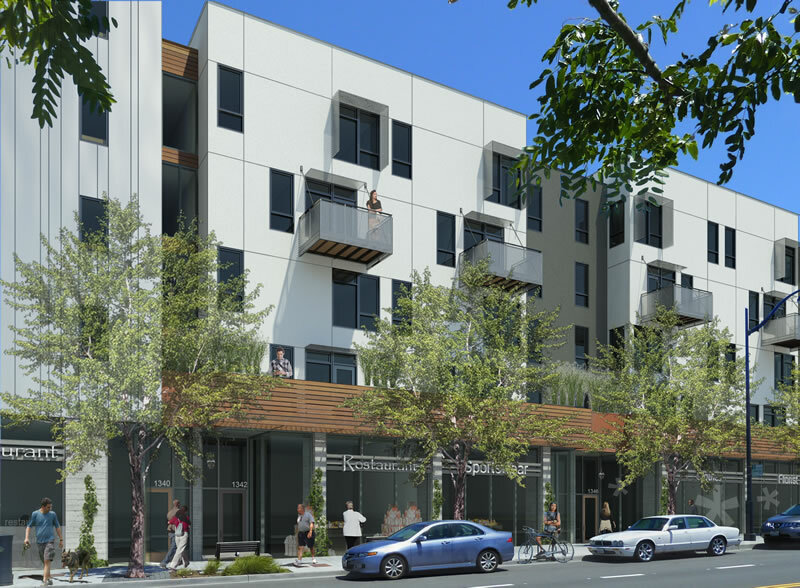 The building permits for 200 affordable apartments to rise on the western portion of Mission Bay Block 7, fronting Fourth Street between China Basin and Mission Bay Boulevard North, were issued last year. 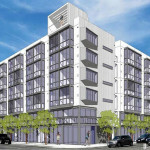 And according to a plugged-in source, the ground for the four-story development – a development which has been waylaid for years, in part due to the dissolution of San Francisco’s Redevelopment Agency – will be broken in April and the building should be ready for occupancy in September 2016. 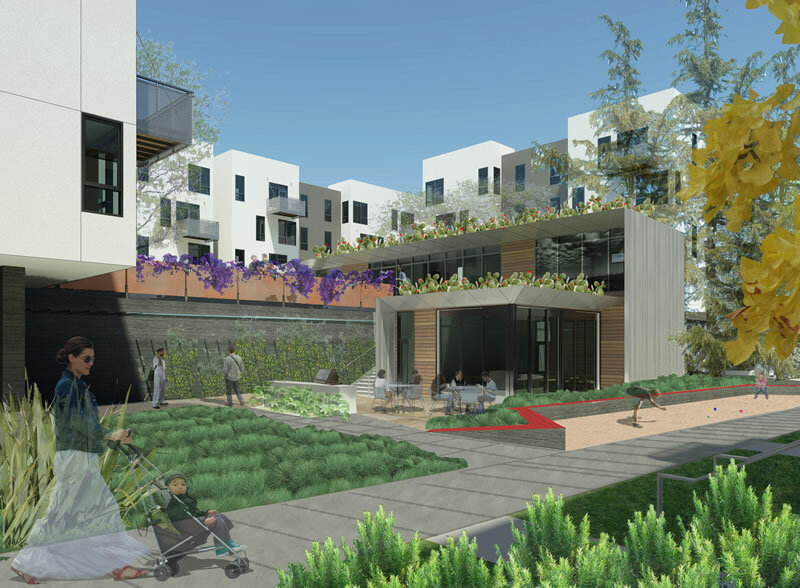 Originally intended to be developed by UCSF, which would have provided occupancy preferences for UCSF employees, the project is now being developed by Related California along with the Chinatown Community Development Center. 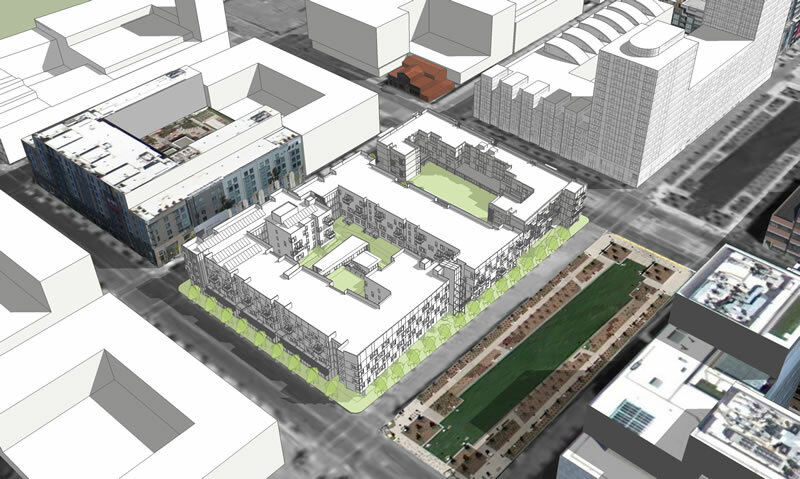 The project will target households with incomes averaging up to 60 percent of the Area Median. And while UCSF families will no longer be given any specific preferences for securing an apartment, employees of universities and health care institutions in San Francisco will be given a general preference for 50 of the project’s 200 units. The Project will be a significant 230,000 square foot mixed-use building with an interior courtyard at both grade and podium level. 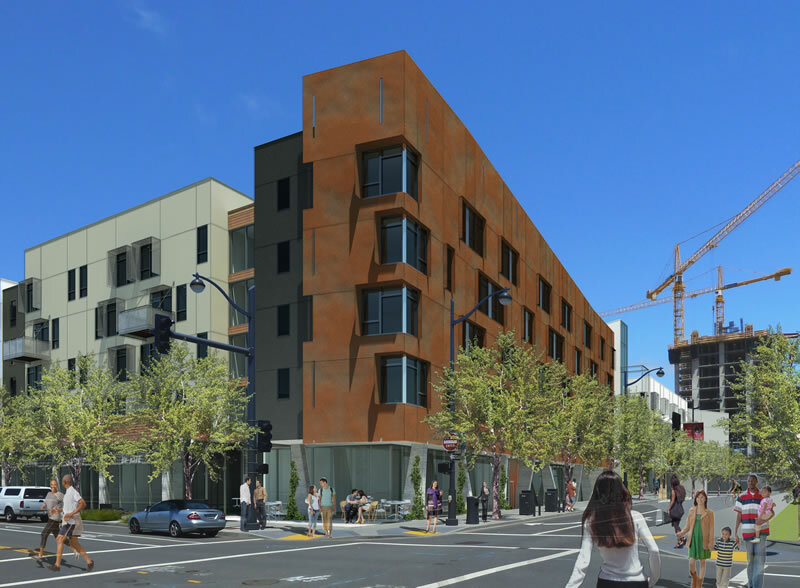 The building will be bounded on the west by 4th Street, on the north by China Basin Street, on the south by Mission Bay Boulevard North, and on the east by a private walkway, or pedestrian mews. Because of the large size of the lot, the design uses variations in massing to break up the building into distinct components. 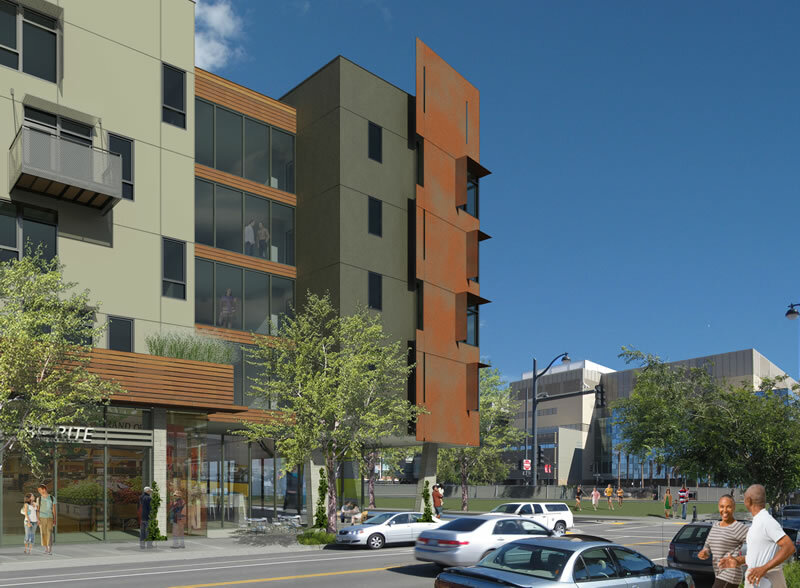 The west portion of the Project that fronts 4th Street is four stories of residential uses above a ground floor podium that accommodates the project’s retail and parking. Retail is located along the 4th Street frontage and wraps around the corner at Mission Bay Boulevard North. This corner serves as the focal point of the project — located across from UCSF — and uses variations in materials — including Cor-ten steel siding, galvanized metal siding, and steel and composite lumber awnings — variations in colors, and various sized projections on upper floors to distinguish it from the rest of the project which features smooth-troweled cement plaster in four color variations. The retail includes glass storefronts and includes locations for future signage to create an interesting pedestrian experience. The eastern portion of the building that is bounded by the pedestrian mews includes four stories of residential uses. The ground floor is set back 20 feet from the pedestrian mews and includes walk up residential units with stoops. The north side of the building features stoops leading to ground floor units, a secondary lobby to the residential component of the Project, and the entrance to the covered parking. The south side of the building also has stoops to street accessible ground floor units, the primary entrance to the residential component of the Project, and a break in the massing where the building’s 28,000-square-foot courtyard is visible from the street. The internal courtyard is divided into two open space areas: approximately 9,000 square feet above the parking podium and approximately 14,000 square feet at-grade. Both spaces are programmed with walkways, planters, and small green open spaces. The podium-level courtyard features an open, turf covered area as a place where children can play, among other activities and the project is located a two block walk from a 1.12-acre Children’s Park that will be completed in late 2015. The garage for the development will include parking for 52 cars and 306 bikes. 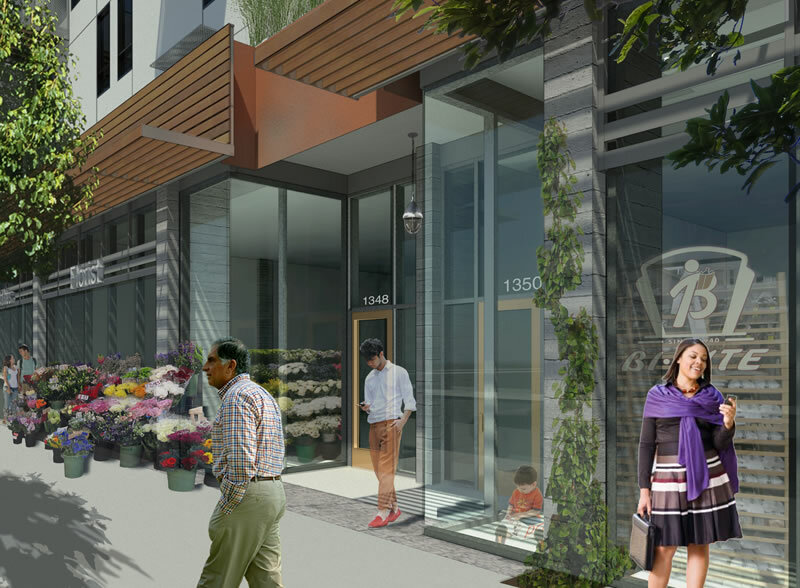 And while rendered with a Bi-Rite on the corner, the grocery remains an “artist’s conception,” at least for now, but there will be over 10,000 square feet of retail space fronting Fourth Street. I just don’t understand the appeal of COR-TEN steel. Perhaps it’s b/c I’ve visited Detroit. Very little maintenance cost going forward. I get that your comment is a bit snarky bout Detroit, but no it’s NOT just one big rusting, old city. They have many struggles, but they are coming back. As for the cor-ten panels, think more about the material as virtually maintenance free and as it ages, it takes on a very rich, multi-colorful patina. Q: Will the rust stain the surrounding areas? A: Yes, rust runoff will likely stain the surrounding areas. 4. So do other architects and clients. its a tacky material popular ten years ago. Cheesy architects love it. “a very rich, multi-colorful patina” he he he. Cor-Ten salesman? 200 Units and 52 parking spaces?! I guess they don’t like families with kids. Oh well, maybe I can double the rent on my parking space. Yes, of course. Families with kids can’t exist in a city without a car. How have the four of us been surviving all these years? It’s worth adding, a city that wants to encourage families is wise to plan for a future with safer and more livable streets. This can best happen by promoting and encouraging more sustainable transportation modes (transit, walking, cycling) and by discouraging rampant automobile use and ownership. As hard as it is for some to fathom, widespread automobile use directly contributes to streets that are unfriendly for children to bike and recreate on (let alone cross) and it negatively impacts the air that those kids must breathe. Furthermore, our collective embrace of the car is greatly contributing to global warming which will imperil this very project. a city is not the place to raise a kid riding bikes on the street. this is near one of the worse parts of the city. you really want you kid out riding their bike. this is the urban core of a major city. If you want kid friendly bike streets, move to the suburbs. Lots of cities have urban cores with children safely riding their bicycle in them. We can do it too. can you name an American city with a similarly dense urban core “with children safely riding their bicycle in them”? I’ve lived and worked in this area for over 20 years and I’ve never seen a child on a bike in SoMa or Mission Bay, aside from on the Embarcadero sidewalk or in Mission Creek Park. I see plenty of adults on bikes every day. I’ve also visited at least a dozen SFUSD schools (thanks lottery system) and never seen the full cluster of bike racks that are common in the suburbs. “At Bessie Carmichael Elementary School, over 150 students walked with parents, or joined one of five “walking school buses,” to make their way through SoMa to reach school before the bell rang, sending a strong message to thousands of nearby commuters: families live here, children walk here. Amsterdam, Copenhagen, Brussels. I am sure I could come up with others. No American cities. Yes, and all of them pay more than twice as much for gas as we do. Slap an additional $3/gallon tax on gas and use the money to build mass transit and safer bike/walk streets and I’m sure we could match them. I look forward to voting for that ballot initiative. Meanwhile, almost all my neighbors that have had babies moved to less dense neighborhoods when their kids outgrew their toddler trikes. neither of those 3 eu cities have as dense an urban core. i dont personally know anyone who wants their kids biking near the tenderloin, and the 1st reason why has nothing to do with cars. we hve very low density areas and then very high density areas. if you want your kids to ride their bike in SOMA on the main roads, you are in LA LA land. the suburbs is much better kind of living for that. The cities with highest percentage of bicycle usage are all mostly small “Oxbridge” communities, many times located in the suburbs (click on my name for list). What is most frustrating to me is that the SFBike Coalition has hijacked the transportation dialogue of this city. When we SHOULD be talking about more and better public transit, we instead get a bloated MTA that spends all its time focusing on bike lanes and parking revenue. BTW- the revolving employment door continues between the bike coalition and the SFMTA as the new media director for the MTA was just hired from the Bike Coalition. How about hiring some public transit planning engineers for a change? I am still especially angry about the proposed removal of parking spaces for bike lanes on Chestnut Street and would hope they could focus their energy on extending the new subway to Chinatown north to Fort Mason and the west towards the Marina instead. those are all college towns. i dont think the chestnut plan will go through. too many smart and wealthy people in the marina to bow to that. im there relatively frequently and there are few bikes around. The marina is definitely a driving area because public transit is terrible. MarinaGuy, if we can cut through the hyperbole we see that the MTA expenditures devoted to bicycle projects are less than 9 million dollars out of a total budget of over 900 million. The MTA is actively investing in an improved and modernized Muni with more transit vehicles and more reliable, faster service. This is what San Francisco needs and this is what enables people of all ages and families (!) to call this city home, no car required. Please spare us your delusions. If the bike coalition ran the MTA we’d have streets that were much safer and more inviting to bike on already; at the rate of progress it’s going to take decades (at best) to make San Francisco a truly bike friendly city. Objectivity was “hijacked” from your comment. It must be the bike coalition’s fault. The Polk Street project alone is going to be many times over the 9 million dollars spent on biking baloney figure floated by some politically correct MTA publicity hand out, NoeValleyJim. I can see rebuilding Polk to create faster transit speeds for MUNI, or better Pedestrian Safety, but the fact is, the only thing that is “off the table” for community discussion is the bike lanes which were publicly stated as the reason for the Polk Street reconstruction project. They only brought up pedestrian safety or transit issues after the neighborhood backlash. Oh Really? The Polk Street project is an attempt to make the street more livable for everyone. The proposed bicycle improvements to Polk Street have been severely watered down, possibly to the point where the potential to entice people out of cars and onto bikes has been squandered. The multi-million dollar redesign of Polk Street will make it a much safer corridor for pedestrians, and bicyclists will also have a marginally safer street. There will also be a few improvements to Muni infrastructure along Polk, ie. bus bulbbouts, but the serious transit investment is happening one block over, with BRT. I believe the estimated travel time savings if one were to travel from Market to Lombard on Van Ness BRT is only 2.3 minutes, AND let’s not forget this time savings includes the fact that almost half of the existing MUNI stops are removed from Van Ness in the new BRT plan. The increased travel time for cars on Van Ness will be over 6 to 7 additional minutes minimum. No Golden Gate Transit or private coach (Google, Facebook, tour buses, etc) would be allowed to use the BRT lanes. “The Project would require up to 58 months (5 years) of construction during which time up to four lanes of traffic and bus service would be obstructed and delayed. FEIR, p. 9-6. Although the FEIR claims that only a few blocks at a time would undergo construction, those obstructions would cumulatively affect the heavy traffic on US Highway 101/Van Ness Avenue and other streets and the existing transit for the entire duration of construction. Oooh the interrobang means you’re serious. 200/52 undoubtedly solves more woes than the 110/110 you’re sneering for. Lower income people saddled with car ownership is for rotted out rust belt suburbs. (Trust me, I’ve visited them recently.) So, my snark aside, what exactly do families with kids need to do that can’t be accomplished with carshare or rideshare? I’d think that the most important feature that a family would want in a residence is multiple bedrooms. Then bathrooms. A parking spot would be nice though further down on the list. And families that really want a parking spot can still obtain one in this project. Why are these not at least 8 stories rather than 4? This could be closer to 400 units. I just don’t get why this city is so scared of height. Because we don’t have the transportation infrastructure to support it. This block is between two T stops, six blocks from CalTrain and six blocks from the future Chinatown “subway”. The frickin’ thing should be 20 stories tall. No, it shouldn’t be. This is appropriate scale and height. We don’t need to emulate China. agree its a shame we are not building for the future when we build an entire new neighborhood from scratch. this development would look great in Walnut Creek. 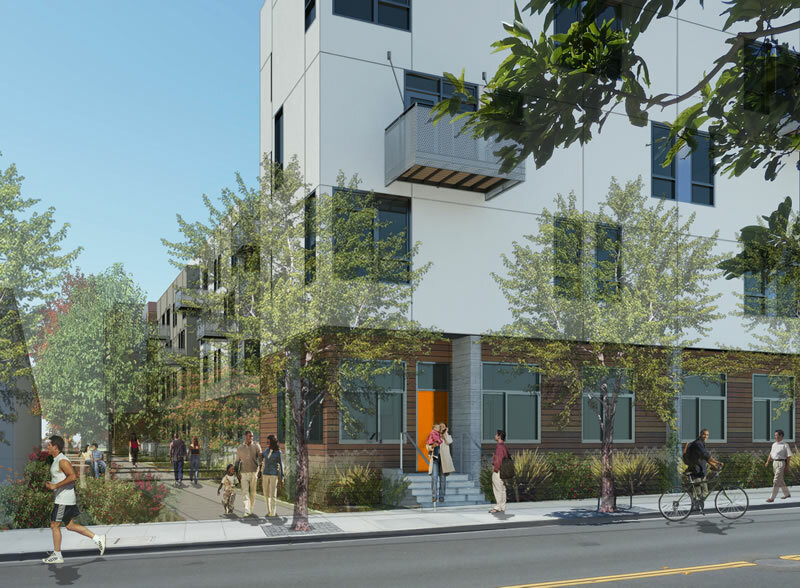 200 “affordable housing” units is more than plenty for this ‘hood. Bring on the market rates. By law, 32% of all the housing units in Mission Bay have to be affordable units. The market-rate units have been “brought on” in the neighborhood for years. Anybody who hasn’t been to Mission Bay or looked in its direction could be forgiven for not noticing the eight or so large market rate condo buildings that have sprung up in the past couple years. About five or six are nearing completion right now. No kidding, I was there over the weekend for a research project and can’t believe how much it has changed. I still had to walk to Philz for coffee though. Mews, mews. Isn’t this an English word, like moat? Curious to see the quality of the interior finishes and layout, hope there is intelligent interior design. Mews means stable yard. Many of them were converted to housing in central London starting in the 1970s. Originally kind of looked down on, the Mews owners are laughing now. “My milkshake brings the boys to the yard…” Yes, I look forward to the use of the word cloisters.